With the festive period* now at full speed ahead almost upon us, it is probably opportune that I (finally) tell you about the Les Tendres de Chanel Les Roses blush which is a travel exclusive item, since some of you might be travelling. I purchased this on board Malaysian Airlines where I saw it labelled as “Flight Exclusive” and I have not even see it at the duty free stores. I’m not sure if other airlines also carry it. Here it is in all its unsullied glory! 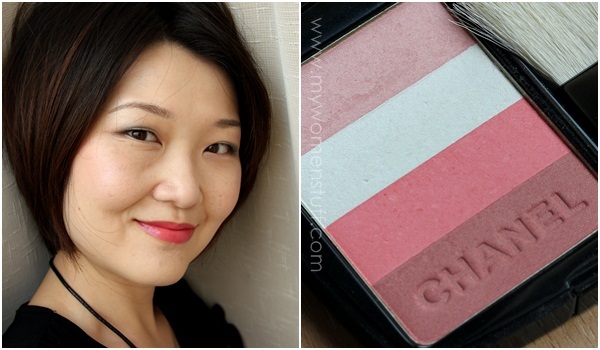 The Les Tendres de Chanel Natural Finish Face Highlighter and Blush in Les Roses. As the ridiculously long name implies, this is both a face highlighter and blush. It in fact looks very similar to what Chanel was offering for the Summer collection – Soleil Tan something something… (which I passed on for being too dark). The difference is that instead of a bronzer-blush, this is a highlight-blush. The blush colours are the two lower shades – a rose and a browned rose, and the highlighter shades are a light pink and a white. It isn’t shimmery and it is all very sheer. VERY sheer. But glowy. It took me a while to break into this compact, but when I did, I couldn’t stop using it. Despite the sheer colours, it gives a lovely glow to the skin that I absolutely loved. The problem however, if I can call it that, is that the highlighter shades tend to apply a little white on the skin. So if you are of a darker disposition, I don’t think you’d like this very much. I bring you no swatches because the first two colours barely show up when I try to pick it up. It only really shows up when you run your brush over it. In fact, the white haired brush included in the palette does a decent enough job. It does feel a little scratchy on the skin, but it works well enough so you don’t have to carry a separate blush brush if you prefer not to. On my skin, this is what it looks like. How I like to apply is to brush over the bottom two rose shades and apply to the apples of my cheeks. Then, I dab on the highlight colours on the high point of my cheekbones, closer to my eye socket. I also sometimes use the highlighter shade to run it down the middle of my nose. Lovely sheer rose tinted blush and highlighter powder in one compact. It applies very sheer but can be layered to build up colour. The white highlighter shades may be a little white on those who are darker but it is a very subtle highlight that isn’t glittery and gives a soft glow to the skin. Unfortunately this is a Flight Exclusive and only available on board certain airlines including Malaysia Airlines. A reader Mon asked me in the comments of the Diorblush Pink in Love review if I prefer Pink in Love or this Les Roses and how they compared, or if they were totally different. My answer was that they are actually very different. Pink in Love is much more pigmented. Les Roses is much sheerer. If I wanted something more pink that needs less work to show up, I’d go with the Diorblush Pink in Love. If I wanted something a little more subtle with brightening highlight qualities, I’d go with Les Roses. 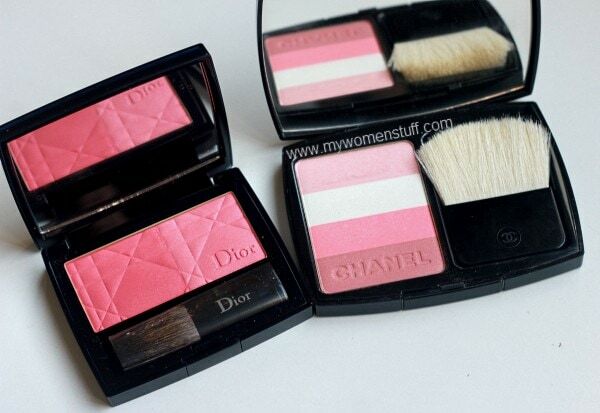 I do however, find that the Dior blush applies better in terms of texture. Its silkier somehow. Les Tendres de Chanel Natural Finish Face Highlighter and Blush in Les Roses is a flight exclusive and purchased on Malaysia Airlines flight for RM178. NEXT POST: Your Say: Do You Wash Your Hair Everyday? wah. i’m not a blush person but i think you’re making me lem (lemm? lemming?…) for the pink in love. SO NAIS. okay randomness done. feeling jittery this morning thanks to san fran coffee. Lucky I don’t have to see it, or I’ll buy it!!! Yay! I’m headed away too! Vietnam is fun too – I love the street food so make sure you fill up on it. Eeeks, when are you going? I’m leaving on Wednesday. Ah will be away from Wed too hehe… and for the better part of the following week. Enjoy your holiday! loved it! very beautiful, I’m dying to test! 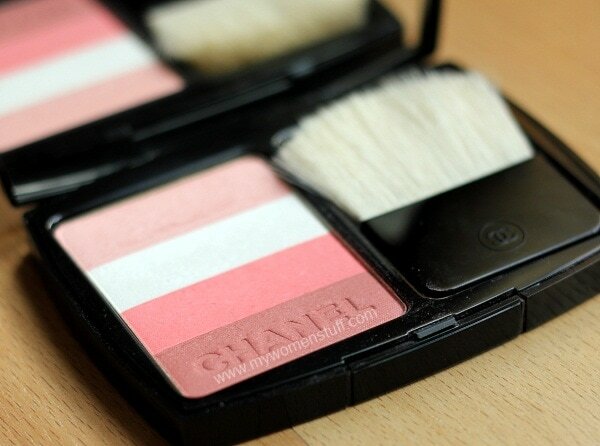 the blushes of chanel and lancome are my favorites. Hold on… now we have to fly to buy… makeup? Ah yep! The lengths they make us go to eh? 😉 And not available on budget airlines either LOL! Haha! true eh? But now with the Airasia-MAS deal who knows what we’ll be seeing! I wish 🙁 If I were, you’d be the 1st to know 🙂 But no I’m not boohoo! Super pretty – will look for it at Duty Free! In flight duty free, Jamilla! 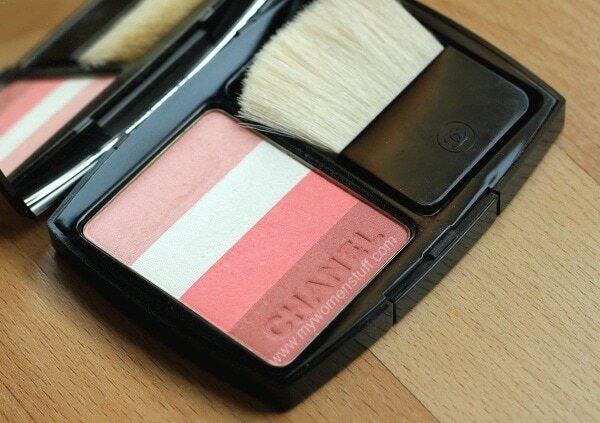 Lovely blush! and I think the lipstick is makes the whole look very complete. Love the lip color, it matches well with the blush. Well done! Hi ParisB, on the topic of travelling, I will be transiting through KLIA in November. Can you share what’s good in KLIA, duty free shopping and beauty wise?? Hi KS – I just got back from KLIA LOL! Its now quite good beauty wise. There are standalone boutiques for MAC, Bobbi Brown, Shu Uemura, La Mer, Anna Sui (and a couple more I forget) where the prices are a little lower than downtown. There are also the regular cosmetic brands in the bigger stores – Estee Lauder, Lancome, Biotherm etc as well as fragrances and duty free or travel exclusive deals. I can’t recall off hand, but if you have a hankering for something and it can wait, get it at duty free. I don’t quite know why its cheaper there since we don’t get taxed on cosmetics, but who’s complaining eh? 😉 I got my Bobbi Brown BB Cream for about RM126 at KLIA and it retails at RM159 downtown so that should give you an idea. Ive been looking for this!!! I’m flying to Eu in 2 weeks via MAS so hopefully it will be on sale on my flight!!! !